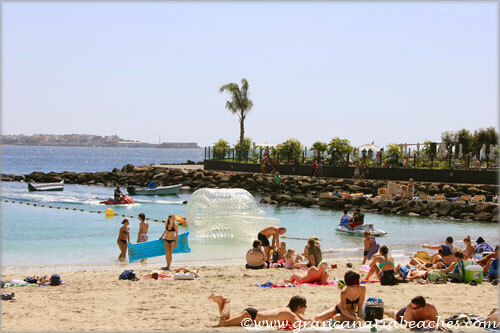 The beach of Anfi del Mar is one of three artificial beaches on the island of Gran Canaria. Year after year, it is visited by locals as well as tourists, because it is maintained in great condition. 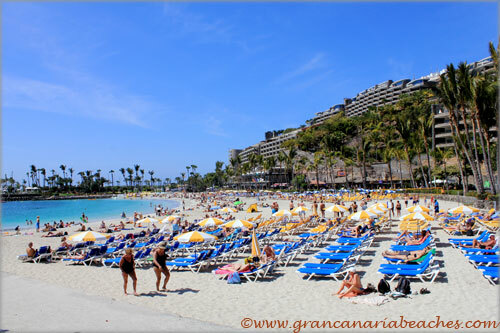 Tourists staying in other areas of southern Gran Canaria, are offered free trips to the resorts located next to this beach, so they can see if they would like to purchase a time-share. 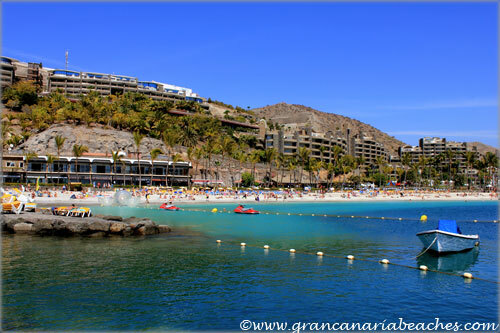 This beach is located in southern Gran Canaria in the municipality of Mogan. It was made together with the time sharing complex that is located around it. 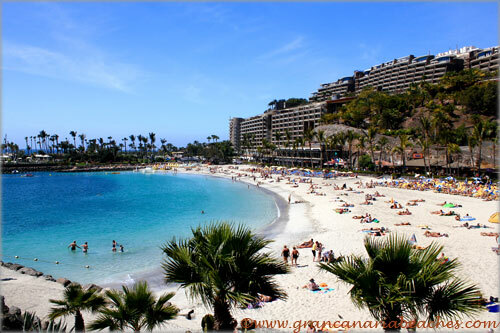 Both the beach, and the luxurious time-shares are named “Anfi del Mar”. The water is clean and refreshing and the sand colour is something between gold and white. The combination of this colour of sand and the high quality of the water could make us think that we are in any of the Pacific islands. This beach offers visitors a variety of activities that will make your day. For the most romantic, the ride to the beach gives couples a moment of calmness and enjoyment, thanks to the many shops of typical products, the best local and international cuisine and the mouth watering ice cream and fast food stalls. For the lovers of water sports, this beach has a great deal. 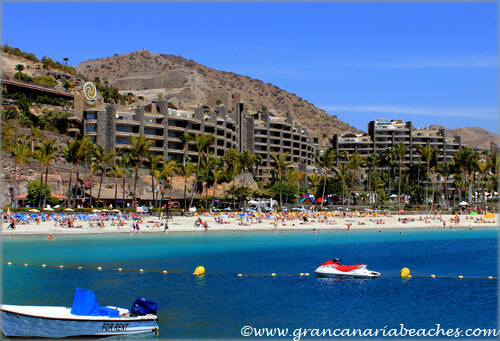 You can rent jet skis or take a tour on small ferries and discover the highlights of the area. Small boats can be rented at the marina (which belongs to the time share complex) next to the beach. 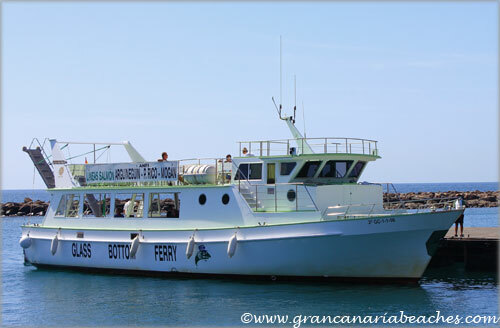 The glass bottom ferry, pictured below, takes you from Arguineguin, Anfi, Puerto Rico to Mogan, and back. Also, in the sand, you can exercise with the various sports matches that are organized, such as beach volleyball and tennis. Although the highlight of this tourist spot will always be to enjoy a few hours of sun lying on the great sand and taking a dip in the water. The waters are specially taken care of, so it offers a clear blue color and a perfect temperature for your enjoyment. The beach is located in a geographically protected area, and there are no dangerous currents. The way it is designed, and the protection of the levees on both ends of the beach provide added security to keep out the waves at times of high activity. You can be easily reach this beautiful beach by both car, or by public transport. By car, Anfi is located on the GC-500 road between Arguineguin and Puerto Rico. There are many parking options, including a large paid public parking space located just off the roundabout at the top end of the resort. From here it is just a quick 5-minute walk down to this beach. As well as convenient transport connections, this beach also has a number of convenient facilities. 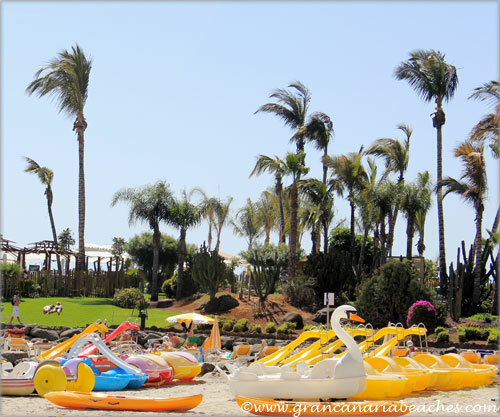 Sunbeds are available to rent on the beach and cost 4 euros per day. There are free public toilets located in the small shopping mall. Here there are also a number of shops with a great range of high street clothes and a SPAR supermarket making it easy to find everything you need for your day at the beach. After you enjoy the daytime activities on the beach, this resort offers you the chance to enjoy live entertainment and to share with your friends and family, and go for a stroll through the resort gardens.